So, here we are on the first day of National Recycle Week and I’ve been thinking some more about what I’m doing. 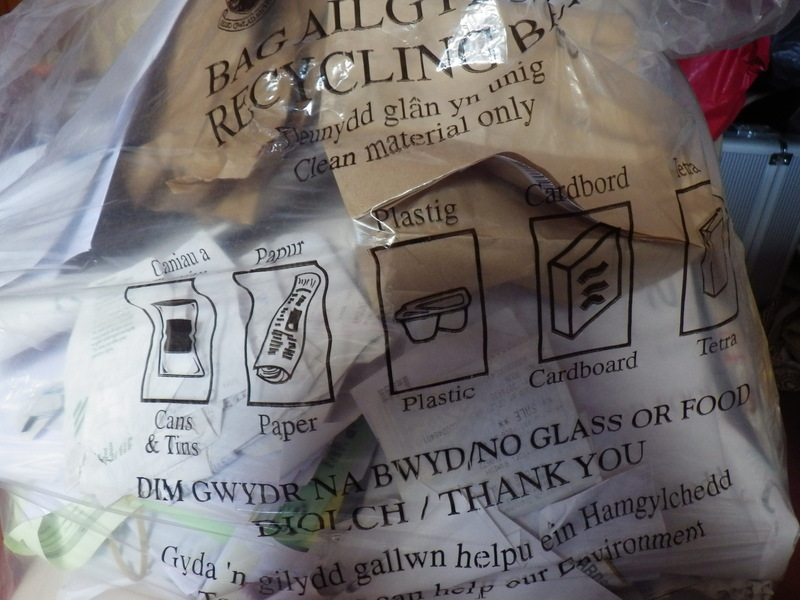 Monday is, in fact, recycling collection day Chez Snail – the council collects cans, tins, paper, plastic, cardboard, tetrapaks and polystyrene from homes in our county once a week, so much of our recycling is a no-brainer. Items for recycling go straight in the bag provided and are put out to be picked up every Monday. Everyone in the street seems to do this without any trouble, and folks have even got used to the food waste bins that are emptied at the same time. In fact, we rarely put out any food waste because (1) we don’t waste food* and (2) peelings etc end up either in the chickens or in the compost. I think that, in our house, everything that can be recycled is, so why should I be thinking much about this subject? Well, the answer is that we still sometimes have waste that cannot be recycled and also I’d like to have less to recycle. It seems to me that the only way to reduce the amount of stuff that needs to be recycled, and thus to reduce the waste stream, is to think about the whole life-span of any item. If we considered the length of time an object could serve its purpose and the destination of that object at the end of this time, we might make better purchasing decisions. 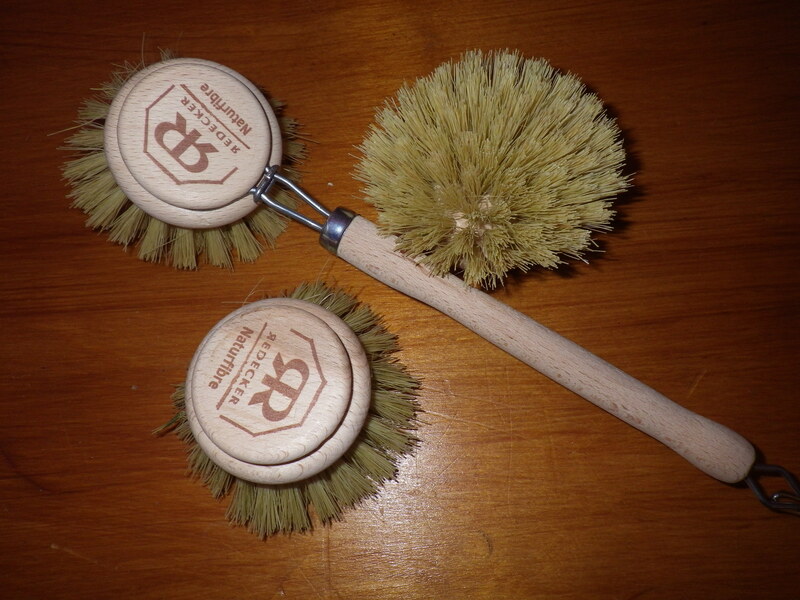 It is wooden and has natural (plant) bristles. Plus, as you can see, it came with two replacement heads. Now it may be that the bristles fall out after 20 minutes, but at this stage I’m feeling quite happy, because even if a head doesn’t last very long, I can put it in the compost heap, or use it to light a fire. This brush (apart from the metal bits) should never enter the municipal waste stream… and should provide energy rather than consume it when it comes to the end of it’s life as a washing-up brush. Now, that’s my sort of product. * Despite Mr Snail thinking that the stinky cheese in the fridge should be classified as ‘food waste’! Love the brush! Where did that come from? Surprisingly, it came from Amazon! The other interesting thing was that all of the packaging was paper based – no plastics at all, not even the parcel tape, so all recyclable or compostable. I don’t order from them very often so perhaps this is standard now. Wow! I’ve seen some seriously atrocious packaging from Amazon so this is seriously cheering! For doing the dishes, I like to use a big chunk of loofah instead of one of those green nylon scourer thingys. Again, it’s natural, biodegradeable – and you can actually grow your own in this climate, although the process of drying and cleaning a loofah gourd is beyond my patience…. They do become a bit feral after a while, but when that happens, you just put them in the compost. Gosh I learn so much here. I like the new scrub brush. I’ll have to see about it when mine finally wears out. You can get anything from Amazon. We are very lucky to have a variety of natural products stores in NY but I do catalog/online shop for things, too. There’s also a Japanese scrubber made from peach pits that works very well on pots and pans (they come in gentle and less gentle styles). It lasts a very long time and works very well. Thanks for sharing these tips! Last year my nephew gave us all environment friendly toothbrushes, made from bamboo. It was a bit weird to use at first, but seems to do the trick (well, my dentist thinks so, anyway!). I’ve seen mixed reviews of bamboo toothbrushes, so this is encouraging… something for me to try out I think.